Studio Line: Universal Pictures - A story of innocence lost and courage found. Tom Cruise delivers a riveting and unforgettable portrayal of Vietnam veteran Ron Kovic in Oliver Stone's Academy Award-winning masterpiece. Based on a true story, the acclaimed film follows the young Kovic from a zealous teen who eagerly volunteers for the Vietnam War, to an embittered veteran paralyzed from the mid-chest down. Deeply in love with his country, Kovic returned to an environment vastly different from the one he left, and struggled before emerging as a brave new voice for the disenchanted. Academy Awards: Won for Best Director; Best Film Editing. Nominated for Best Picture; Best Actor-Tom Cruise; Best Screenplay; Best Cinematography; Best Sound; Best Score. 1990. DVD: Widescreen 2.35:1; audio English DD 5.1, French Dolby Surround; subtitles Spanish; closed-captioned; single sided - dual layered; 16 chapters; rated R; 85 min. ; $26.98; street date 10/31/00. Supplements: Feature Commentary with Director Oliver Stone; Production Notes; Cast & Filmmakers Bios. After the huge success of Platoon in 1986, Born on the Fourth of July was Oliver Stone’s first return to the subject of the Vietnam War. However, the 1989 film took a different approach to the subject. It included very little combat footage and instead focused on the home front; how the conflict affected the lives of citizens is the main subject. Actually, Born is mostly concerned with the war’s impact upon one citizen, a Long Island, New York native named Ron Kovic. Played by Tom Cruise, Kovic starts as a wide-eyed, patriotic kid who innocently believes the US can do no wrong. Due to his fervor, he joins the Marines and head to Vietnam. There he experiences a number of shattering events - both physically and emotionally - that greatly affect him. When he returns to the States, he has to learn to adjust to the changing times and his altered state, a process that takes years before he begins to feel “whole” again. Although Born was the second consecutive Stone project adapted from the work of others. His prior attempt - 1988’s Talk Radio - seemed largely impersonal and lackluster, but the same concerns don’t apply to Born. While it doesn’t directly tell the tale of Stone’s own experiences - which were dealt with to a degree in Platoon - the director’s passion for the topic seems abundantly clear, and that’s what makes Born more special than it otherwise might have been. Not that it’s a perfect movie, for - as with every Stone flick - Born suffers from a variety of flaws. Frankly, I thought the pacing seemed weak, and the progress of the film moved in too scattershot a manner. The story of Kovic’s life sometimes felt oddly incomplete, as though we encountered isolated vignettes without much to help transition between them. Nonetheless, the movie conveyed enough material of interest to make it fairly compelling. Born can seem somewhat heavy-handed at times - Stone isn’t exactly the master of subtlety - but that tone actually works pretty well for this picture. The extreme patriotism Kovic displays early on and the Rockwellian depiction of small town life make the changes through which our protagonist goes seem even more jarring. Ultimately his transformation appears like a greater journey because of some of the black and white attitudes; without them, his movement might come across as less significant. Cruise does a more than adequate job as Kovic, though I stop short of thinking it’s a great work of acting. I like Cruise and I’ve always thought he had more talent than many nay-sayers would like to believe, but I don’t know if he has any truly inspired work within him. He paints a solid picture of Kovic, but something about his portrayal felt slightly forced. I always felt as though I could see the thought process as it occurred; Cruise doesn’t appear to play Kovic in a natural style but instead seems to think out and choreograph every move. As a whole, Cruise does a nice job, but I never thought he truly immersed himself in the role; I was always wholly conscious that movie icon Tom Cruise was on screen. However, even though I have some complaints about the movie, Born on the Fourth of July is a good film. I’m not sure I’d classify it as one of Oliver Stone’s best works just because it’s not quite as thought-provoking as many of his others; Kovic is largely a sympathetic character, and there’s not a lot of gray area to be found. Nonetheless, the flick offers an interesting portrait of how war changed one man, and it provides a generally compelling experience. 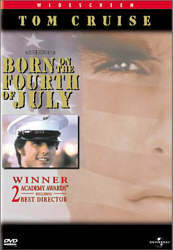 Born on the Fourth of July appears in an aspect ratio of approximately 2.35:1 on this single-sided, double-layered DVD; the image has not been enhanced for 16X9 televisions. While the picture of Born isn’t a complete disaster, it’s close, and it offers easily the weakest image found on any of the Oliver Stone Collection DVDs. Sharpness is the major issue, as Born features some of the most severe edge enhancement I’ve ever witnessed on a DVD. Jagged edges and moiré effects abound on this transfer. Here’s the rule: if it can shimmer, it will shimmer. I saw strobing from virtually every object possible: clothes, buildings, cars, eyes - you name it. At times even hair shimmered due to the excessive edginess! The main times these problems didn’t seem abundantly clear occurred during some close-ups, which looked acceptably stable. Also, the shots toward the end of the film that take place during the 1972 and 1976 political conventions displayed less severe edge enhancement; I still detected some strobing, but it did not seem as problematic. Those instances were exceptions, however, as the vast majority of Born displayed such heavy edge enhancement as to make the movie almost unwatchable. The DVD presented other problems as well. A number of scenes were excessively wobbly as the frame moved around too much. Colors looked oversaturated and messy for the most part. Stone apparently imbued much of Born with a golden tone, but this came across as too heavy and muddy for the most part. A few scenes displayed accurate and attractive colors, but much of the movie suffered from an overly-warm tendency. Skin tones often looked somewhat orange-tinted and unnatural. Black levels appeared largely deep and rich, and shadow detail was acceptably heavy without much apparent thickness. Print flaws started slowly but became more significant as the movie continued. I saw a fair amount of grain throughout the film, and I also witnessed intermittent examples of grit and speckles; the latter became much more prominent as Born progressed. In any case, even had the movie appeared perfect in regard to all these other areas, the extreme edge enhancement made the film nearly unwatchable. Although a few attractive scenes sneak in, the majority of Born looked very bad. Much better was the film’s surprisingly dynamic Dolby Digital 5.1 soundtrack. The soundfield provided a nicely broad and engaging presence throughout the movie. In the front, the side channels offered well-delineated and accurately-placed effects that enlivened the experience, and John Williams’ score also sounded cleanly-presented, with fine stereo imaging. The surround added nice reinforcement to the music plus very solid effects when appropriate. Not surprisingly, those elements sounded most active during the battle scenes, but the movie found many other opportunities to add ambient effects to the mix. I didn’t detect any significant split surround usage, but the overall impact was very good. Audio quality also seemed quite strong. Dialogue sounded natural and distinct, with no signs of edginess or problems related to intelligibility. Effects were bold and accurate; they always seemed clean and without distortion, and they also provided a solid impact when appropriate. The music was bright and clear and generated good depth. All in all, the soundtrack to Born presented a dynamic and involving experience that sounded better than I expected from a modestly old film. Although Born doesn’t include many supplements, we do find one substantial extra. That would be the running audio commentary from director Oliver Stone. As is usually the case, Stone provides an interesting and stimulating discussion. He splits time fairly equally among three different topics: generally production notes such as remarks about the cast and the film’s development; statements about various historical liberties and the facts of Kovic’s life; and reflections upon Stone’s own life and experiences. Though a couple of Stone’s commentaries are relative clunkers, this one offers a compelling experience that conveys a lot of informative details and thoughts. Otherwise, Born only includes some minor text supplements. We get some surprisingly lengthy and interesting “Production Notes” plus brief but decent biographies in the “Cast and Filmmakers” section. The latter areas provides listings for seven actors plus Stone. Oddly, no trailer appears on this DVD. In Born on the Fourth of July, Oliver Stone examines the impact of the Vietnam War on a smaller level than in Platoon; he shows how the conflict affected one of its soldiers. Although the movie isn’t a great piece of work, it does provide a generally solid and compelling experience. Unfortunately, the DVD itself offers an exceedingly unattractive picture. Despite very good sound and a strong audio commentary from Stone, Born needs to stay on the shelf due to that ugly image; it makes the movie nearly unwatchable. Note: The version of Born on the Fourth of July reviewed here appears in both the six- and 10-DVD Oliver Stone Collection packages. The film can also be purchased on its own in a release from Universal; that DVD and this one differ only in the style of packaging they use. The OSC edition comes in a snapper case that reads “Oliver Stone Collection” at the top.